If you are looking for information about tours to Machu Picchu, visit FindLocalTrips.com where you can compare itineraries, operators and prices. If you are looking for information on the best buses to take to Cusco, visit our passes page. If you would like to get more general information on Machu Picchu, read our tips and guide further down! 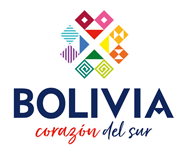 Please note this tour will be booked via FindLocalTrips.com a search and comparison website we recommend for tours across all of South America. The town of Aguas Calientes (also known as Machu Picchu Pueblo), is the starting point of ascending to Machu Picchu, is not reachable by car. Machu Picchu is located on a mountain ledge, one thousand metres above the valley floor below. There is no direct way to get to Machu Picchu Pueblo from Cusco, it is necessary to use a combination of transport methods to get there, unless you walk the entire way. There is a road as far as Ollantaytambo from Cusco, and a railway from there to Aguas Calientes. Machu Picchu then lies at the top of the mountain above Aguas Calientes. A road goes up the mountain from Aguas Calientes. There is no road access to Aguas Calientes from any of the surrounding towns. The cheapest one-way train ticket from Cusco to Aquas Calientes costs approximately 60 USD. It takes around 3.5 hours for the 110 km. If you add the return train ticket (120 USD) to the price of the entrance ticket (40 USD approx) for Machu Picchu making it a very costly experience, however a visit to Peru would not be complete without seeing it. To access the site, you must have a ticket for Machu Picchu – which are available online in advance or from various ticket offices in Cusco. Machu Picchu tickets are NOT sold at the entrance gate and are limited to 2500 per day, with entrance to Huayna Picchu and Montana Machu Picchu each being further limited to 400 per day. During peak times of the year, tickets for these additional elements can sell out weeks in advance. 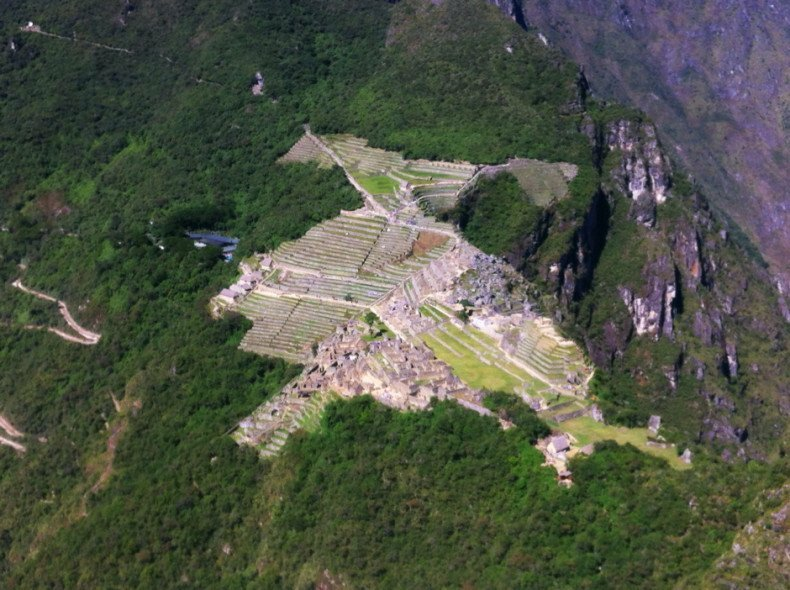 Huayna Picchu is the highest peaked mountain of Machu Picchu with Inca structures on the top at 2,720m. The walk uphill takes about 50 minutes to reach the top of the mountain, the scenery from the summit is extremely impressive, you can see the main square of Machu Picchu about 600 meters down and the Urubamba canyon all around. The walk is quite tough and a decent level of fitness is required. Montana Machu Picchu is located at the southwest end of Machu Picchu and is a longer trek, less steep and less crowded and also offers great views over Machu Picchu and surrounding area but it is a longer hike (takes about 1 hour 30 to the summit). To climb one of the mountains you need to purchase a permit in combination with your Machu Picchu entry ticket. This must be bought as an add-on to your Machu Picchu entry ticket at the time of purchase (they cannot be purchased separately from the Machu Picchu entry ticket so once purchased a mountain pass cannot be added or cancelled). The Classic Inca Trail is South America’s number one trek and one of the most well-known and popular treks in the world. Offering 4 days of trekking along original paved Inca pathways, a variety of fascinating Inca sites and the beautiful scenery of the Machu Picchu national park the Inca Trail is one of those things that everyone should do once in their life. The official Inca trail is closed every year for the month of February to give the trails some time to recover and carry out maintenance. It is strongly recommended to book your Inca Trail at least 5 months in advance as permits can quickly sell out. Prices range from $550 to $1550. The Inka Jungle tour is a four day trek to Machu Picchu for the ultimate adventurer! This action packed tour allows you to experience the astounding views of Machu Picchu after a three day adventure of hiking and biking through the mountains, jungle and a section of the ancient Inca trail; river rafting on the Vilcanota River; and flying through the air on zip-lines in the Santa Teresa canyons. One of the most popular trips to Machu Picchu with daily departures and usually plenty of availability all year round. Prices range from $200 to $350. The Salkantay trek is a true Andean crusade, this 4-day trek through the dramatic Cordillera Vilcabamba is a wonderful alternative for those who want to take a less-travelled and exceptionally beautiful route to Machu Picchu. Mount Salkantay is the 2nd largest mountain in the entire Cusco area (2nd only to Ausangate) and is said to be the “guardian” that stands between the mountains and the jungle. Crossing over a pass between the peaks of the immense mountains, Salkantay (6270m) and Humantay (6070m), you will get to see some spectacular views of the glacier and the sprawling valleys that they stand over. The National Geographic magazine has frequently listed this as one of the top 10 treks in the world. Prices range from $250 to $450. The Lares Trek is an excellent alternative to the Inca Trail. Taking you off the beaten track with visits to authentic Andean communities whilst being surrounded by stunning mountains, lakes and valleys. This trek combines amazing mountain scenery, glacier lagoons, cloud-forest valleys and authentic Quechua textile communities as well as a visit to the Lares hot springs. Departures are frequent but not daily as there is not the same demand as the other treks. Prices range from $200 to $400. On the other hand, for those who have some time to spare, a relatively new attraction near Cusco is now open to the public. This new attraction is called Rainbow Mountain Peru and it is basically a mountain displaying colorful formations that resemble the ones seen on a rainbow. Find out more at rainbowmountainperu.com and do not miss this amazing place! 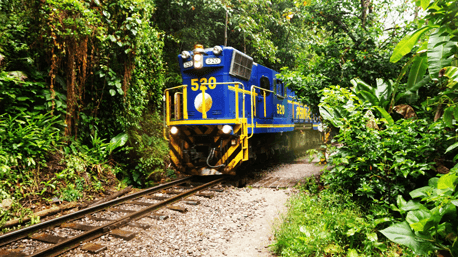 2 Day Train – Taking a train to Aguas Calientes and spending the night there before an early start the next day – trekking up the mountain to the ruins or boarding the shuttle bus that leaves every couple of minutes. Taking one of the trains back to Ollantaytambo before being dropped back to Cusco in a mini-bus is a very popular choice for visitors. Prices range from $200 to $350. This can also be shortened to a 1 Day Train option, forgoing a night in Aquas Calientes and leaving from Cusco at 3/4am to catch the first train to the town at the base of the mountain Machu Picchu is situated atop of. Take the shuttle bus up to the entrance and spend some hours exploring the complex before returning to Cusco in the same manner. Prices range from $200 to $300. 2 Day Bus/Walk – Taking a bus from Cusco all the way to Hidroelectrica (the last train stop before Aquas Calientes) via Santa Maria on both paved and unpaved road. From Hidroelectrica it is a flat 3 hour trek alongside the train tracks and river to Aguas Calientes. Spend the night there before an early start the next day – trekking up the mountain to the ruins or boarding the shuttle bus that leaves every couple of minutes. After visiting Machu Picchu descend the mountain and walk back along the train lines to Hidroelectrica before the long drive back to Cusco. This is the budget option with departures daily. Prices range from $100 to $200. To book a tour of Machu Picchu we recommend you use FindLocalTrips.com a search and comparison website for tours across all of South America.